Interpower is pleased to announce that it is now manufacturing cord sets with polarized and non-polarized NEMA 1-15 plugs and IEC 60320 C17, as well as connectors and power cords with IEC 60320 C17 connectors. Black cord set with a polarized NEMA 1-15 plug and straight IEC 60320 C17 connector on 18AWG SJT cable (P/N 86222155). Black cord set with a polarized NEMA 1-15 plug and angled IEC 60320 C17 connector on 18AWG SJT cable (P/N 86222165). Black cord set with a polarized NEMA 1-15 plug and angled IEC 60320 C17 connector on 18AWG SJT cable (P/N 86222175). SJT cable (P/N 86222285). This part supersedes P/N 86532230. Black power cord with a straight IEC 60320 C17 connector on 18AWG SJT cable (P/N 86295820). Black power cord with an angled IEC 60320 C17 connector on 18AWG SJT cable (P/N 86295830). Black power cord with an angled IEC 60320 C17 connector on 18AWG SJT cable (P/N 86295840). 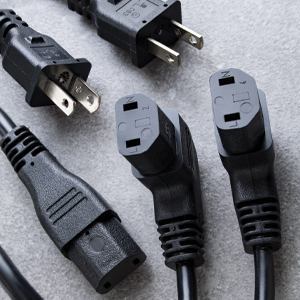 These are Class II Standard AC Power Supply Cords for Use in North America. Interpower has no minimum order or dollar requirements and offers a 1-week U.S. manufacturing lead-time on non-stock Interpower products with same day shipping on in-stock products. Blanket or scheduled orders are available. Interpower also offers value-added services, along with free technical support. For questions or for more information, please e-mail sales@interpower.com (United States) or uk@interpower.com (United Kingdom) or contact Customer Service in the United States at (800) 662-2290 or in the United Kingdom at +44 (0) 1908 295300.